…shapes everything that happens in life. 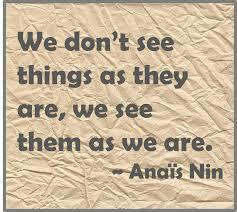 And perception is a matter of choice. Indeed, it’s a blessing to be able to choose how personal experiences and the world at large are viewed. As a result, we can choose to see peace, rather than conflict; love, rather than fear; abundance, rather than lack; and we can to see a divine plan, instead of random chaos. Abraham Lincoln is credited with wisely saying: “Most of us are just as happy as we make up our minds to be.” So very true. Choose happiness and you will be happy. Choose to see the best in your team and they will be inspired by it. Choose to see other beings as fellow spiritual travellers and they will feel encouraged. Choose to see your employees as team members and they will fight for victory. It is truly amazing how fantastic and simple life really is. Don’t make it complicated – it’s so very easy.